Everyone knows Uncle Sam – he takes his slice of your pie before you ever even see it. But what about the lesser known local and state income tax bites? Did you know, in some cases, people can pay more in state and local income taxes than they do federal? If you’re one of the many medical professionals moving to a new state this year, it is in your best interest to understand these additional income taxes before making the plunge! All other states charge income taxes ranging from 3.07% (PA) to 13.3% (CA). Some states charge a flat tax (same % of income no matter how much you make) and some use a progressive tax rate (% increases as your income increases). 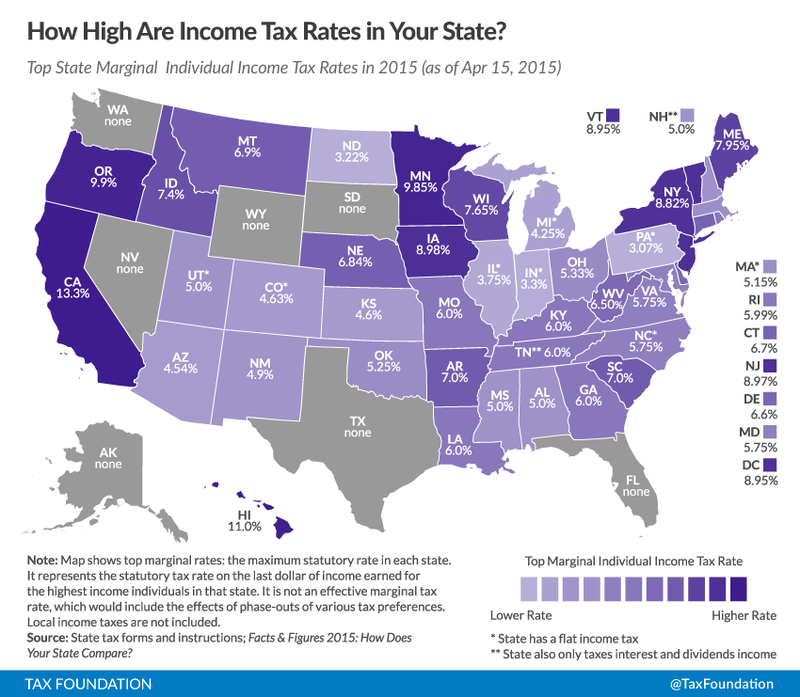 The Tax Foundation has a great map that shows each of the states and their associated income tax rates. The Tax Foundation provides much more detailed information about each state’s specific taxes if you’d like to read up on them further. Maine, Minnesota & Oregon have the highest state income tax rates for your typical residency or fellowship income. Their top tax brackets are not the highest, however, rates increase rapidly at lower income levels than with most other states. With an income level of $50,000 to $100,000, these states quickly become the highest income tax states. California & Hawaii take the biggest tax bite for your higher income earners. Single Californians are taxed at the highest rate of all, at 13.3% (for earnings above $1,000,000). Hawaii will tax earnings above $200,000 (single) or $400,000 (married) at 11%. Many locations also require that local income taxes be paid in addition to state and federal taxes. These income taxes can range from 0% to 3.928% (Philadelphia was the highest we could find). The tax foundation provides details on local taxes around the country as well. Kentucky falls somewhere in the middle of the pack when you simply consider state income taxes. For Lexington residents, though, you also have a local income tax of 2.25%. With the combined local and state taxes, this puts Kentucky on the high end of the spectrum in regards to income taxes. There are many other taxes to consider as well: property taxes, sales taxes, etc. Some areas will also add taxes to your utilities and these are often overlooked. Ultimately, you should understand the taxes of the state you live in and the state you are considering moving to in order to be in a position to make the best decisions. Have you looked up the state & local income taxes for your future home? This is an important step as you plan ahead and begin planning out your new budget. As you can see from this exercise, the ranges can fluctuate substantially between tax rates in different states and localities. Despite this information, you should not let taxes solely dictate your major life decisions. They should, however, be under consideration. Don’t be like many of your peers and discover your higher tax rate after you receive your first paycheck. Take action now and find out what you should expect to pay in the location you’re considering so you can make wise decisions with your money!